I made the time this weekend to make the changes to my home that I had been thinking about for a while. 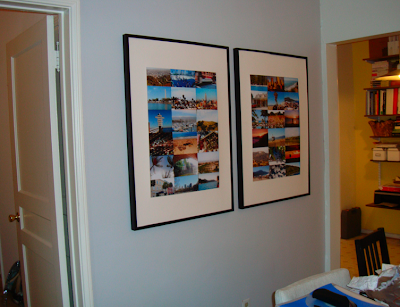 I re-did 2 rooms for under $150. 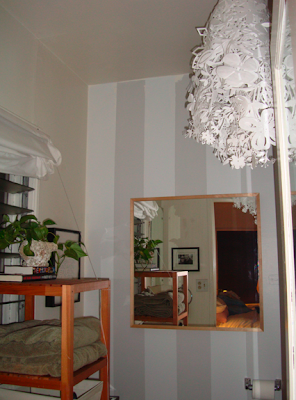 The red wall in the main room is now a pretty pewter gray and our bathroom has stripes and a new light fixture. I am thrilled with the result!! Our small space actually feels bigger all around! I taped off the wall and then did a coat of gray based primer. This little trick helped cover the bold red hue. We wanted to use eco-friendly paint with a decent price tag so we decided to try Home Depot's FreshAire line in Nauralist Gray. 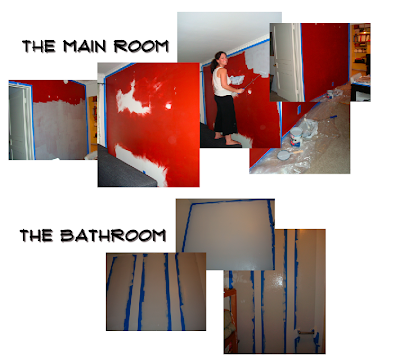 The paint went on smooth, barely smelled and it washed off my hands easily. 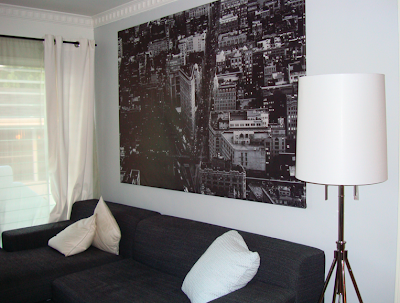 At first I wasn't sure how the gray wall would feel with our gray couch but it really works! The paint, although a lighter tone, really pops and the art gallery feels brighter. aaaah! 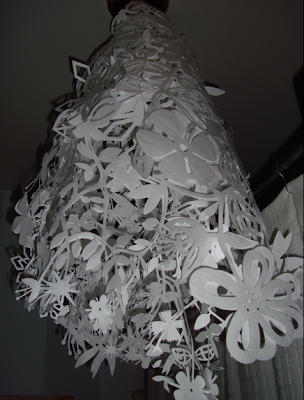 i always love it when i find someone else who has tord boontje's midsummer light. :D i'm still trying to find the just-right spot for it in our new place...but it's lovely in your bathroom. your blog's lots of fun! I'm loving the stripes! I really am looking for something fun with my bedroom, but not positive I want to Paint the entire thing, what do you think about stripes in a larger room? i love the color transformation and how much more spacious the bathroom feels with the vertical stripe! Awesome job!!! !